Lila (Meryl Streep) pays a visit to Ann and her daughters (Natasha Richardson, Toni Collette). Constance (Natasha Richardson) and Nina (Toni Collette) unload long-kept troubles. Nina (Toni Collette) shares a quiet moment with her mother (Vanessa Redgrave). Arden's (Toni Collette) and Rudy's (Giovanni Ribisi) date takes an unpleasant turn. Rudy (Giovanni Ribisi) asks Arden (Toni Collette) out for a date. 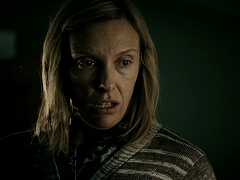 Arden (Toni Collette) is attacked by her mother (Piper Laurie) for talking to the police. Excerpt from the making of documentary on "Evening", including interviews with Claire Danes, Natasha Richardson, Vanessa Redgrave and Mamie Gummer. Press junket interview with Toni Collette to promote the theatrical release of "The Dead Girl" in the United States. 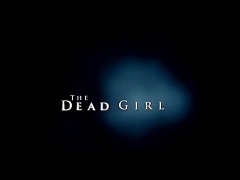 B-Roll footage from the making of "The Dead Girl", featuring a scene with Toni Collette and Giovanni Ribisi. Television spot for "Evening", directed by Lajos Koltai and starring Claire Danes, Vanessa Redgrave, Mamie Gummer, Natasha Richardson, Toni Collette and Hugh Dancy. Theatrical trailer for "Evening", directed by Lajos Koltai and starring Claire Danes, Vanessa Redgrave, Mamie Gummer, Natasha Richardson, Toni Collette and Hugh Dancy. Theatrical trailer for "The Dead Girl", directed by Karen Moncrieff and starring Toni Collette, Marcia Gay Harden, Rose Byrne, Mary-Beth Hurt and Brittany Murphy. April 01, 2007. Toni Collette talks about her current films and her album Beautiful Awkward Pictures. January 15, 2007. 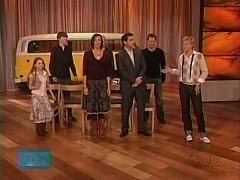 Greg Kinnear, Steve Carell, Toni Collette, Alan Arkin, Abigail Breslin and Alan Arkin attend Ellen DeGeneres Pre-Golden Globe show to promote "Little Liss Sunshine". September 08, 2007. Toni was nominated as Best Supporting Actress in a Mini-Series or Movie for "Tsunami: The Aftermath", alongside Judy Davis, Samantha Morton, Anna Paquin and Greta Scacchi. February 14, 2007. Toni Collette presents Orson with the International Breakthrough Award at the 2007 Brit Awards. February 11, 2007. 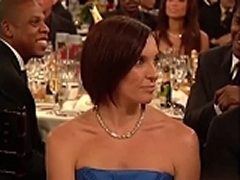 Toni Collette was nominated as Best Supporting Actress for "Little Miss Sunshine" and presented the BAFTA for the Best Foreign Language Film. January 15, 2007. 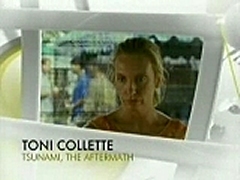 Toni Collette was nominated as Best Supporting Actress in a Mini-Series for "Tsunami" and as Best Actress in a Musical or Comedy for "Little Miss Sunshine". January 14, 2007. The cast of "Little Miss Sunshine" accepts the Critics Choice Award for Best Ensemble. July 07, 2007. 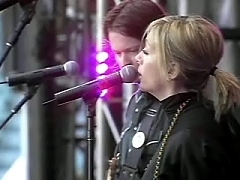 Toni Collette and the Finish perform at the Live Earth concert in Sydney, Australia. March 03, 2007. Toni Collette is interviewed and performs with "Toni Collette and the Finish" at the Cool Aid special programme. Television special on Toni Collette's music career and the recent tour through Australia. February 2007. Toni Collette predicts Helen Mirren to win the Academy Award during an interview at the Brit Awards. February 08, 2007. Toni Collette is interviewed on the red carpet at the 2007 BAFTA Awards. February 08, 2007. Toni Collette is interviewed by Ruby Wax on the red carpet at the 2007 BAFTA Awards.